OSHKOSH B’GOSH GIRLS 6 NAVY BLUE WHITE POLKA DOT ZIP UP PUFFY VEST POCKET FLEECE LINED Condition is Pre-owned. Shipped with USPS First Class Package. Oshkosh b gosh Girls knitted vest, Size L. Cute Oshkosh b gosh Girls knitted vest, Size L.
Quilted Puffer Vest. Winter Outerwear. Girl's Sz 12. Pink Green. Armpit to Armpit: 19" Across Front. OshKosh BGosh Size 7 Kids Button Up Jean Vest VGC!!! Puffed vest by OshKosh size 12. Good used condition. Little stain next to the zipper and another in the back (see the photos). 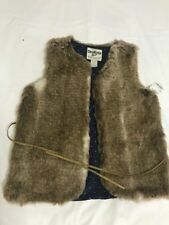 OSHKOSH B'GOSH FAUX FUR VEST. Sleeveless, Fully Lined, Zipper, 2 pockets. COLOR - PINK. GIRLS SIZE 4 OSHKOSH PINK BLUE GREEN YELLOW PLAID VEST BUTTON UP FRONT CUTE @@! This is a girls size 4 vest made by OSHKOSH! this is blue, teal, yellow, & pink plaid. three pink buttons on the front. 100% cotton. With my current classes, about 50 hours a week is dedicated to my classes & school work. Osh Kosh B'Gosh. Purple Puffy Vest. Childs size 5. In good pre-owned condition. No flaws. Smoke free home. Red vest with a navy blue flower. This is a boys size 18 months navy blue/bright orange/red poofy winter vest by OSHKOSH! Zip up front with velcro covering closure. & Glo Girl Jean Pants sz 2T. Place Premium Jean Jacket sz 3T. Ombre denim with embroidered hearts. Faux fur on collar and sleeves, Snap front and cuffs, cotton animal print lining. Oshkosh Girls Suede Vest - Size 4/4T - Excellent Used Condition. Soft & Warm Suede Vest. Outside 100% Polyester Suede, Inside 70% Polyester/30% Acrylic Soft Pile. Soft fleece Interior. Suede Exterior. Girls Osh Kosh Vest 8, teal outside, pink inside. In excellent condition, no stains, rips, tears. Worn once, maybe. Comes from a smoke and pet free home. Condition is Pre-owned. Shipped with USPS First Class Package. SET OF 2 CHILDREN'S PUFFER VEST. Size 5 Puffer Vest in Great Condition! This Vest Shell Is Velvet. Has Fur Trimming on the hood. Filling is Polyester. Has A small Washable stain to the right from zipper. Has Really Nice and Soft Cotton Fabric inside. Down Back - 14 in. Good, gently worn. No holes or stains. OshKosh Girls’ Size 5 Sleeveless Fleece Zipup Vest! Good Condition! 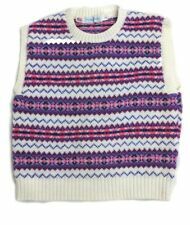 Keep your child warm and stylish with this sleeveless fleece vest from OshKosh. It’s a girls’ size 5 and has cute little embroidered flowers near the left front pocket to give it a little fun detail. SO CUTE !! OSH KOSH REVERSIBLE VEST. GREEN PLAID/ BLUE. IT ZIPPERS UP THE FRONT AND IS PURPLE WITH FLOWERS IN PINK/BLUE AND THE LINING IS PINK. THIS IS ADORABLE.